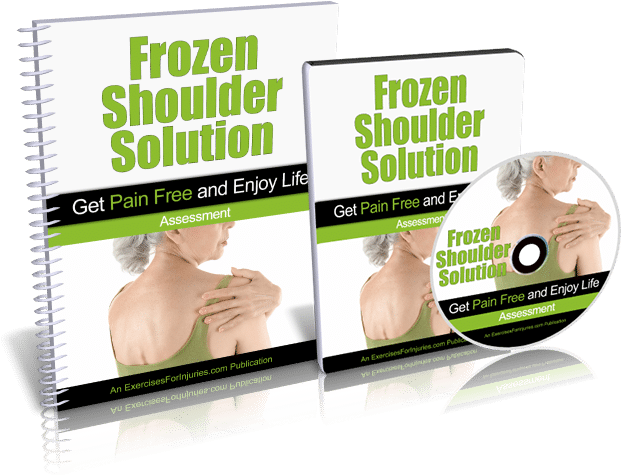 Discover How to Get Rid of Frozen Shoulder & Regain Pain-Free Arm Movement Without Surgery or Expensive Physical Therapy Sessions! 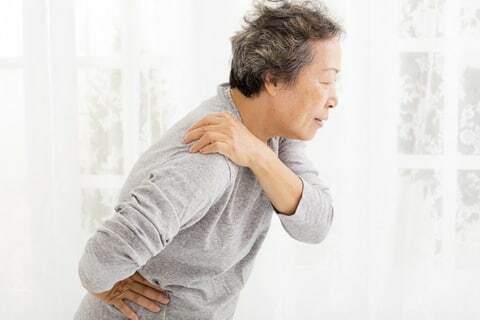 While the name may imply something that can be “thawed” and quickly returned to normal, frozen shoulder sufferers learn this isn’t the case with their condition. The truth is Frozen Shoulder can take a big toll on a person’s life. The lack of sleep alone that the condition causes can make a person feel tired, depressed and like they are “breaking down” as many of my former clients used to say. Add to that, the excruciating pain that can be produced by the smallest arm movement and you have something that most sufferers wouldn’t wish on their worst enemy. As a renowned exercise and injuries expert, I have treated numerous patients with Frozen Shoulder. I have seen what it can do to a person’s mental state. I’ve seen how it can negatively impact a person’s life. Suddenly, the littlest things are painful and hard to do – like driving a car, throwing a ball, or simply raising your arm to get something off of a shelf. You may no longer be able to play with your kids or lift a baby in the air. Unfortunately, the standard non-surgical treatment for Frozen Shoulder can take months and months to be effective. That’s months and months of pain and discomfort from the simplest arm movements… not to mention numerous sleepless nights. To make matters worse, the wrong physical therapy exercises can further restrict motion and make it feel like someone is stabbing you in the shoulder with a knife! There is also no guarantee that expensive and often painful surgical treatments or injections will alleviate your symptoms. Plus, there is also the painful recovery period from surgery that you would have to deal with. So what’s a Frozen Shoulder sufferer to do? How can they get rid of the pain as fast and as easily as possible? 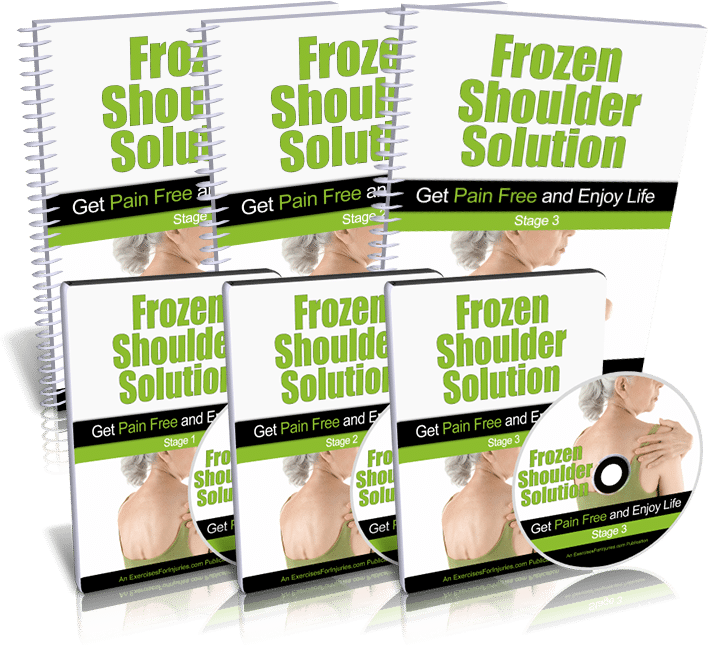 Years of working with Frozen Shoulder sufferers taught me what works and what doesn’t when it comes to healing Adhesive Capsulitis (AC), which is the medical name for the “Frozen Shoulder” condition. Basically, AC, or Frozen Shoulder, is a spontaneous inflammation of the capsule tissue surrounding the shoulder joint where the collarbone, scapula and upper arm bone meet. I’ve compiled an easy-to-do program that contains the absolute best exercises for Frozen Shoulder recovery. And I didn’t stop there. I then determined the least number of exercises that you need to do and put them in the right order and the correct amount to create a program that covers all of the areas that need to be addressed in order to recover from Frozen Shoulder as quickly and as easily as possible. In other words, I’ve created a program that will allow you to heal your Frozen Shoulder at home on your own. That means no painful surgery, no expensive doctor visits and no therapy sessions that disrupt your already busy schedule. With this program, you can do the exercises when and where it is convenient for you. There’s no driving out in the rain or snow to get to a session… no getting stuck in traffic… no having to take time off work. This program also includes descriptive guides and comprehensive videos that break down the exercises so that proper form is easy to learn. I understand people have busy lives with jam-packed schedules, that’s why I’ve made this program not only highly effective, but also highly efficient. You won’t have to spend hours each day doing time-consuming exercises. With this program you do exactly the exercises you need to do in the amount and order you need to do them. There is no extra, no fluff. This program is also great for fitness professionals! If you have clients with Frozen Shoulder, they are simply going to love you when you use this program! They will appreciate the effectiveness of the exercises and the fact that it doesn’t destroy their schedule and put them in a situation where they are in a mad rush trying to catch up all day. Still, the medical community doesn’t have a full understanding of what causes it. Many believe underuse of the shoulder is a primary cause but there may be other factors involved. What is known, is that women get the condition more often than men and that those age 40 to 60 are at the most risk for developing it. Currently, 2% to 5% of the population is dealing with Frozen Shoulder and many of these individuals will endure pain for many months longer than they need to, simply because they aren’t aware of the program you are discovering right now... a program that has been meticulously designed to heal Frozen Shoulder and allow users to once again move their arm pain-free. You see, the problem with a lot of recovery programs that are available on the Internet is that you don’t know the qualifications and expertise of the person behind them. In other words, you just don’t know who you can trust. And doing the wrong exercises can do a lot more harm than good. 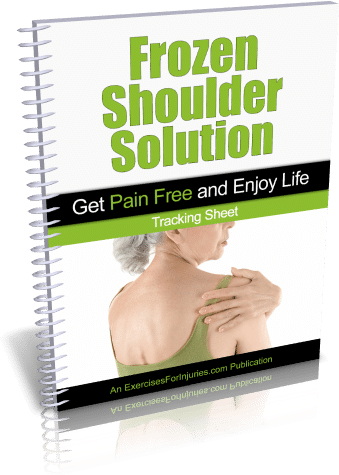 You could actually make your shoulder pain much worse – and unfortunately there are a lot of inexperienced physical therapists and fitness trainers out there who don’t really know what works and what doesn’t. I’ve seen individuals end up worse off than they were before. How depressing do you think it is to undergo lengthy physical therapy only to end up in more pain than before? Well, I’ll tell you – it is a tremendous gut punch that leaves many feeling depressed and distressed. The simple problem in many cases was that they were doing the wrong exercises, which were aggravating their condition and not making it better. These people lost months of pain-free movement simply because they chose to save a few bucks by using some free exercises they found online. Let me stress: You just don’t know the motivation or the knowledge level of some of these so-called experts out there. It is much better to be safe than sorry. Often with a lot of the free exercises that are out there, key components of a recovery program are missed. Also, the order the exercises are performed can also be very important. Doing them in the right order can vastly increase their effectiveness. You also need a program that really stretches the affected area. This is vital for creating good range of motion and flexibility. I’ve created a program that does all of the right things – helping you get better fast. So Who Am I & Why Should You Listen to Me? 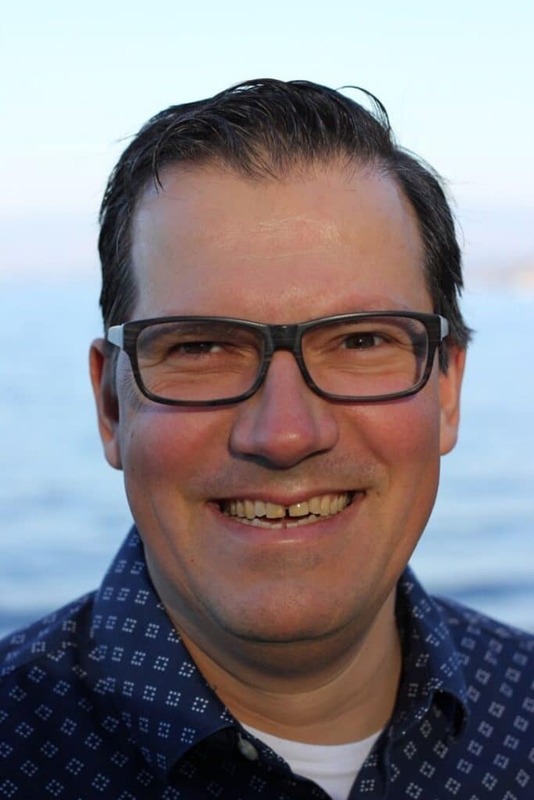 My name is Rick Kaselj, MS, and creating programs that help people heal injuries and eliminate pain is exactly what I do. I started as a personal trainer, exercise therapist and kinesiologist, but quickly discovered that many of the traditional exercise and treatment programs weren’t producing the results I wanted for my clients. So I took it upon myself to get the right knowledge, scour the medical research, and do hands-on testing, so I could ACTUALLY help my clients get better. With the advent of the Internet, I saw a terrific opportunity to offer and deliver my programs to many more people, so they too could finally get relief from pain, heal their injuries, and get back to the lives they enjoy. My Frozen Shoulder Recovery Program is the result of 6 years of University study (including a Master’s Degree in Exercise Science), over 20 years of hands-on experience, constant searching for the best Frozen Shoulder recovery techniques, and teaching these techniques to thousands of other fitness & health professionals who have then used them to help their clients - plus thousands of personal training sessions with Frozen Shoulder sufferers, and the careful scrutiny of over 8 medical studies. What I’ve discovered is that the body is truly an amazing creation – capable of healing itself from some of the most horrific injuries and by doing simple exercises we can actually help our bodies heal even faster. Now that I’ve told you about myself, let me tell you more about this amazingly effective program. You get manuals that describe the entire program in an easy to understand manner and videos that show you exactly how to perform the exercises… along with a lot more. Plus, the program contains an assessment guide so that you can assess your condition and then use the best exercises that will make you feel better the fastest. It also has a Quick-Start Guide that will show you the fastest way to get started so that you can enjoy pain relief as quickly as possible! You get a video, manual and fill-in sheet to help you assess your current condition. This is important to do because the level of pain and discomfort will differ from person to person. You’ll record your results on the fill-in sheet, and based on your findings, you’ll know exactly where to start in the Frozen Shoulder Recovery Program. This assessment process is critical to ensuring you get the best results possible from the program. The Frozen Shoulder Recovery Program is filled with a lot of beneficial information, but I want you to be able to get started and experience results as fast as possible so I created this guide which distills all the content down to the bare essentials you need to know to get started fast. The Quick-Start Cheat Sheet lays out the exact roadmap you need to follow to regain pain-free movement. I’ve broken this program into three stages. The three stages allow you to self-direct your progress so you get the fastest possible recovery. The stages progress from very easy (Stage 1) to more challenging (Stage 3). This three-stage structure ensures that any person can complete this program and start enjoying pain-free movement again – even those who have severe pain or who have not exercised a day in their life! Give you everything you need – exactly how many reps and sets you should do, time and intensity, what you should feel as you do the exercises so you know you’re doing them right. You also get 3 follow-along videos - 1 for each of the 3 stages. These videos are your very own personal coaching sessions with me. In them, you will do each of the exercises following right along with my exercise assistant, who does them on video with you, while I count out time and reps, and coach you along the way. As mentioned above, for each of the 3 stages in this program, you get an instructional video, a follow-along video, and a comprehensive manual. Once you get into the program and start learning the exercises, you may want a faster, more convenient way to access the exercises, rather than having to fast-forward through the videos, and leaf through the larger manuals every time. That’s exactly what this Exercise Quick Reference is for! Every exercise in the program is laid out in this brief guide so it’s quick and easy to find them, learn them and do them! For every exercise, there is a start and end photo, a quick summary of the exercise, and instructions on how to do it correctly. In my more than 20 years of experience as a kinesiologist and injury expert, I’ve seen time and again that the people who measure their progress while they do my programs experience better and faster results than those who don’t. It’s very important to measure your progress as you do this program. It will keep you on track. It will keep you motivated... which will keep you doing the exercises... which will actually get you the results you want. You simply cannot get the results if you don’t do the exercises! 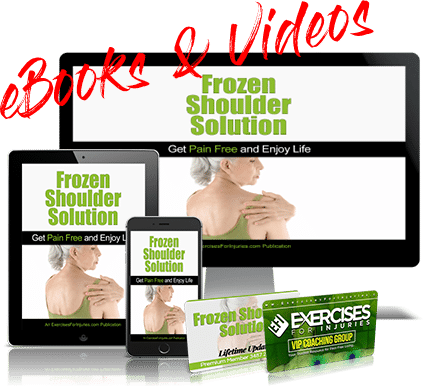 The Frozen Shoulder Recovery Program is filled with expert tips and exercises that will allow you to eliminate discomfort and pain as fast as possible. Plus, with the videos you can see exactly how to do the exercises so you can avoid using bad form which could negatively impact your results. Save yourself money and frustration – get The Frozen Shoulder Recovery Program today and restore pain-free movement! 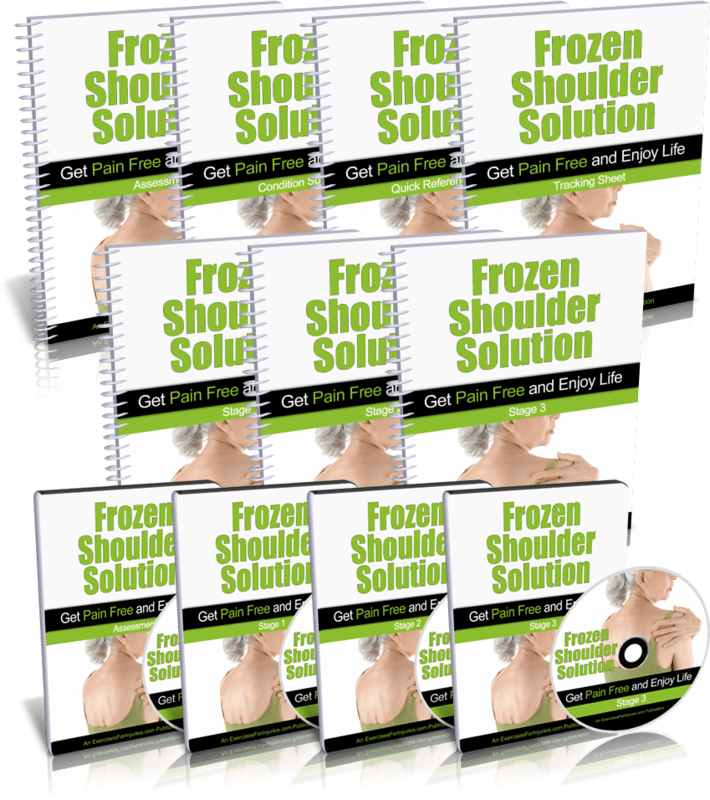 Get INSTANT ONLINE ACCESS to the Frozen Shoulder Solution Program. You get lifetime access to everything 24/7/365, on any computer or mobile device. Don’t risk doing the wrong exercises that can make your condition worse, not better. This program is not just a bunch of exercises thrown together with the hope that they will relieve your pain. This is a carefully designed system that has already helped many people decrease and eliminate their shoulder pain. The Frozen Shoulder Recovery Program is the result of years of scholarly medical research and feedback from real-world tests and experiments with hundreds of clients. Nothing is left out – there will be no guesswork or confusion about what to do. Everything in this program is systemized and laid out perfectly and clearly for you so that you eliminate your pain. Get The Frozen Shoulder Recovery Program today! For just $19 you could save hundreds in medical costs – and that’s not counting all the money you’ll save on over-the-counter pain meds. Plus, With My Unconditional 100% Money-Back Guarantee, You’ve Got Absolutely Nothing to Lose! I am so sure that you will love the Frozen Shoulder Recovery Program that I am offering an unconditional 100% money-back guarantee. That’s EIGHT FULL WEEKS to put this program to the test! I don’t think I can be any fairer than that. Eliminate your shoulder pain or get your purchase price back! it is convenient for you! P.S. Don’t subject yourself to months … or even years of shoulder pain! Get the Frozen Shoulder Recovery Program and get the exercises you need to heal your painful shoulder. You can do this video exercise program at home, completely on your own. You get the scientifically-proven exercises and are shown exactly how they should be performed. This program is also ideal for fitness professionals to use with their clients. The videos show you how to do each and every exercise perfectly, in exactly the right sequence, with exactly the right number of reps and sets, all laid out for you. Order now. P.P.S. Remember, there is NO RISK at all for you when you try the Frozen Shoulder Recovery Program. If you are not completely thrilled with how this program helps you get rid of your pain, just let me know and I will refund your money. Your satisfaction is 100% guaranteed. Order now. P.P.P.S. One more thing – remember this package comes with self-assessment tools! This is important because there are four phases to a Frozen Shoulder injury (Pre-freezing, Freezing, Frozen and Thawing) and you need to know which phase you are in to ensure you do the best exercises to alleviate your pain. This package really has it all! Get yours today for the incredible low price of just $19! Order now.